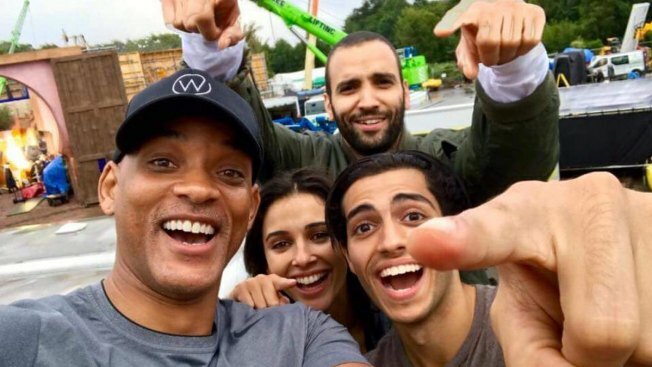 Will Smith, Marwan Kenzari, Naomi Scott, and Mena Massoud in Aladdin. When the teaser trailer for Walt Disney Pictures' Aladdin debuted in October, fans got a first look at Mena Massoud as the titular street rat. The sneak peek showed him entering the Cave of Wonders and finding a magical lamp--moments before he'd finally meet Genie (Will Smith). At the time, fans didn't get to see Genie or Naomi Scott's Princess Jasmine. After months of anticipation, their wishes were finally granted Wednesday, as the acting trio appears on the cover of Entertainment Weekly's Dec. 28, 2018/Jan. 4, 2019 issue. Smith, in particular, had big shoes to fill, as the late Robin Williams originated the role when the animated film was released in 1992. "Whenever you're doing things that are iconic, it's always terrifying," Smith admits. "The question is always: Where was there meat left on the bone? Robin didn't leave a lot of meat on the bone with the character." But, as director Guy Ritchie explains, "The great thing about the role of the Genie is that it's essentially a hyperbole for who that individual actor is, so it's a wonderful platform and tapestry for an actor to fill his boots on." Since Williams "infused the character with a timeless version of himself," Smith decided to follow suit. "I started to feel confident that I could deliver something that was an homage to Robin Williams but was musically different. Just the flavor of the character would be different enough and unique enough that it would be in a different lane, versus trying to compete." And so, his take on the character will pull from his oeuvre. "I think it'll stand out as unique even in the Disney world," Smith says. "There hasn't been a lot of that hip-hop flavor in Disney history." Ritchie is still working out the special effects for Genie, so the image fans see on the magazine's cover likely won't be what they see onscreen. "I wanted a muscular 1970s dad," the director says. "He was big enough to feel like a force--not so muscular that he looked like he was counting his calories, but formidable enough to look like you knew when he was in the room." Massoud and Scott won their roles after an exhaustive global casting call. But even after they were hired, they had to work overtime to do their characters justice. "The singing and dancing I had to really train and put in time for," the actor explains, "as I'm predominantly an actor first." For the live-action remake (hitting theaters May 24, 2019), Ritchie wanted to ensure Jasmine was "a more rounded character and maybe not being such a stereotype of the time." It's a sentiment Scott, a lifelong fan of the original, appreciated. "Jasmine's main objective at the beginning is to really protect her people and to do right by them," she says. "She definitely isn't a finished article at the beginning of the movie, but she has this beautiful arc and progression..."
Rest assured, Ritchie has plenty of surprises in store. "When you think timeless Disney classic, you're not really thinking Guy Ritchie," Smith says of the bold director. "But he brings a beautiful edge to the look and feel and imagining of Aladdin."